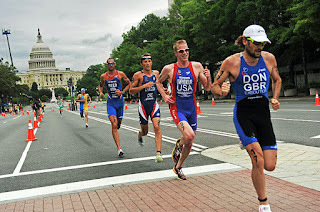 So we headed into D.C. early on Sunday to watch the ITU World Championship triathlon series event.....and to be perfectly honest it was a little disappointing. Don't get me wrong the race was great and the set-up of the course was conducive to spectating. You saw eight laps of the bike course and four of the run course all based on 6-8 minute laps. It was a shame that the swim course wasn't close enough to be able watch and see all the bike and run (at least the JumboTron was showing it). Most of the largest stars of the Olympic distance triathlon world were racing and it was a competitive race made all the better with Andy Potts, perhaps the best all-round triathlete in the world, leading out of the swim and pushing the breakaway for the entire bike section. He ended up 4th after being outrun by the ITU whippets such as winner Alistair Brownlee. The womens race was a showdown on the run between Emma Moffat and Olympic Champion Emma Snowsill, with Moffat showing a clean pair of heels to the field to take the win. As I said before though I was a little disappointed with the race from a marketing and attendance perspective. The crowd was very sparse and apart from a small article in the Post on the morning of the race, it didn't seem particularly well marketed. I know that triathlon is a generally small sport in the U.S. but it appeared that very few of the spectators were non triathletes/cyclists. They did do a good job at the finish/transition area with the grandstand which was full and really got the crowd going but the rest of the course was dead. We were standing at one corner just prior to the short climb up to the Capitol and a police told us that we better cross then as cyclists would be coming through soon....he seemed pretty surprised when we replied that we were actually waiting to watch the aforementioned cyclists to arrive! Hopefully the race will continue to come back for the next few years so the crowd base can grow and people in the D.C. area can really get behind the event. From what I have heard the athletes liked the course and thought it was a cool venue for an event but I guess that organisers are going to look at the bottom-line and then make the decision. Interesting how you mentioned that they didn't market it much. I knew about it as of last Wednesday or Thursday when I rode down Ohio drive and noticed they were setting up the transition area. Then I saw your blog about it.